The Super Nintendo Entertainment System (also known as the Super NES, SNES or Super Nintendo, and known as the Super Famicom in Japan) is a 16-bit home video game console developed by Nintendo that was released in 1990 in Japan, 1991 in North America, 1992 in Europe and Australasia (Oceania), and 1993 in South America. Uses a similar UI to PVV, but has a much easier to manage interface. Save Current State (Ctrl+S): Saves current active screen to computer. SceneViwer: Displays all visible sprites and backgrounds in current state. For basic sprite and background ripping your main focus should be SceneViewer, which is easier to isolate and save to an appropriate paint or photo editing software. "Screen" shows the entirety of the current SaveState with 16-bit and 8-bit options, both of which only serve to switch between alias and anti-alias during display. The Layering box works similarly to the limited disabling capabilities of SNES emulators such as ZSNES in that they only disable what is currently mapped to those layers. "Layers" focuses on three aspects of the state; the regular background, the sprites, and Mode 7 effects (If implemented). Regular Background mainly uses the first of the four "Bg" modes both for main background and foreground where sprites are normally mapped to. The third is often reserved for text or dialogue boxes depending on the game being ripped. Sprites occupy a different layer and separated into parts to be disabled by the list next to the viewer's display window. 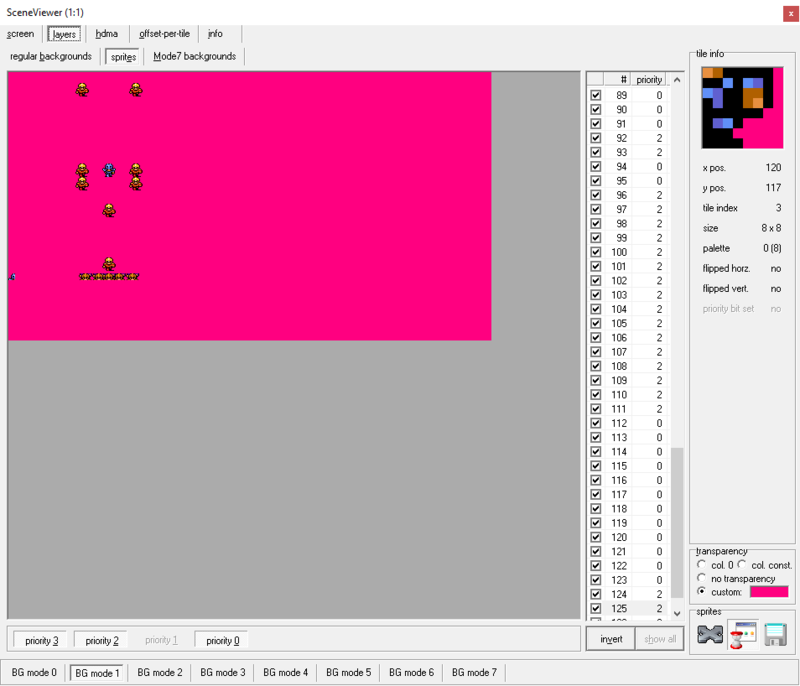 To easily locate and disable any sprites that overlap the ones you wish to rip, simply move the cursor over to that sprite and press tab until the number the sprite is mapped to is highlighted, then press the spacebar to uncheck it. Finally, Mode 7 backgrounds are for backgrounds or sprites that have been assigned to the SNES' Mode 7 capabilities, displaying their original, unaltered ratio either as a fully visible image, or in chunks viewable only when necessary for the current scene. Higan, formerly known as bsnes is a very accurate SNES emulator that supports most, if not all SNES games. Apart from the SA-1 games, the emulator is cycle accurate to a SNES meaning that it is as close as you can get to the console. It also runs games that other emulators have problems with such as Speedy Gonzales and displays the shadows in Air Strike Patrol. Higan does require a powerful computer and requires separate ROM dumps for the various chips that the SNES had e.g. DSP-1 (Pilotwings, Super Mario Kart), CX4 (Mega Man X 2 and 3). Older versions of bsnes have lower requirements and are easier to use because they have Balanced and Performance options where the accuracy is lower but doesn't affect most games and can run on less powerful computers. While not as accurate as Higan, it can run on less powerful computers and is one of the oldest emulators that still gets updated today. BizHawk uses an older version of Higan called bsnes where it still had the Balanced and Performance options so requirements are lower to run. Thankfully it has a sprite/background/tile viewer that is simple to use even though palette select is a bit buggy and to view backgrounds that use two modes (e.g. 1 and 7), you would have to change the scanlines. It also has SNES9X has an option however does not have the sprite viewer. Only mentioned here because many tools such as vSNES, YY-CHR, and Tile Molester require savestates from ZSNES whether it's to rip sprites or for its palette. As an emulator, it was good for its time- however it is very inaccurate and should not really be used in an age where more powerful and accurate emulators exist. Some games don't work or sport numerous glitches that can lead to crashes, sometimes lacking certain sound and graphical effects present on more accurate emulators and original hardware, and the emulator itself does not run games on special chips properly (such as the Cx4 and the Super FX chips). Ironically, some Super Mario World hacks only work on ZSNES. While you can remove layers to get sprites, it is best to just use it to get a savestate of what content you want to rip. WARNING: Using ZSNES is a security risk because it can be used to hack your PC via an exploit.